By 1971 Gong had already undergone the first in what seems to have been an almost continuing series of line-up changes. The Continental Circus and Camembert Electrique albums were recorded by line-up (B). Originally only released in France in 1971 Camembert Electrique was later reissued in the UK at a budget price by Caroline 1974. Musically, it was an offbeat blend of jazz-influenced space-rock, unconventional psychedelia and bizarre experimentation. Indeed, with their communal lifestyle and blend of Eastern mysticism, this hippie band were definitely an anachronism from the sixties, but a welcome one in the more banal early seventies. The original French issue on Byg came in a gatefold sleeve and with a two-page lyric insert. In November 1971 Pip Pyle left Gong to join Hatfield and The North. Laurie Allen replaced him briefly and former Magma bassist Francis Moze was also added to the line-up. However, in August 1972 Daevid Allen decided to disband Gong entirely and came to Britain in search of new musicians. The trip to Britain provided him with new inspiration. Whilst here he met Virgin chiefs Richard Branson and Simon Draper who offered the band a new record contract on their label, Allen returned to France with a new line-up which included former Uriel, Arzachel, Egg and Khan member Steve Hillage, who was playing for Kevin Ayers' band Decadence at the time. At the start of 1973 Gong started work on the first part of what became known as their Radio Gnome Invisible trilogy, Flying Teapot. The recordings didn't go smoothly, Francis Moze didn't really fit in and eventually left but not before Allen had split to Deya with Gilli Smyth leaving the band to perform as Paragong with Hillage and Blake supervising things. The Flying Teapot album appeared in May 1973. It was an avant-garde collection of sound effects, sax, jazzy improvisation and comic vocals with titles like The Pot Head Pixies, The Octave Doctors and The Crystal Machine and Zero The Hero and The Witch's Spell. Gong spent most of the Summer and part of the Autumn of 1973 touring. Their appearance at London's Dingwall's club was partly captured on a side-long contribution to the double album, Greasy Truckers - Live At Dingwalls Dance Hall. Some of it later re-appeared on the Live At Sheffield CD. 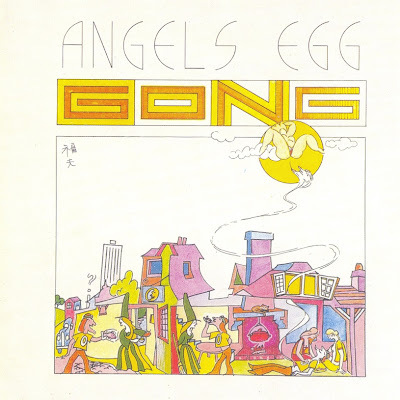 Between the Summer and Autumn 1973 tours Gong recorded the second part of their Radio Gnome Invisible trilogy their Angel's Egg album, mostly in the back garden of their French residence. Early copies came with a booklet containing lyrics and explanations of the inhabitants of the Planet Gong. Uncharacteristically it contained one pop-orientated song, Oily Way and Steve Hillage's guitar-driven I Never Gild Before; but most of the remaining material consisted of the lengthy spaced-out, jazz-influenced jams that typified their sound in this era. The album was released in December 1973 and the compromising position of Zero The Hero's head on the cover in relation to the Moon Goddess meant early copies sported a sticker concealing this section of it. Gilli Smyth left the band in February 1974. Her replacement was Miquette Giraudy. Pierre Moerlen quit temporarily too, but soon rejoined. This revised line-up (F) recorded You, the third part of the Radio Gnome Invisible trilogy, (although it wasn't credited as such). This was also one of their better albums, notable for Master Builder, which converted a gentle Buddhist chant into a frantic live favourite and the lengthy synthesiser-driven A Sprinkling Of Clouds, which had been composed by Tim Blake. After this Daevid Allen left the band in April 1975 during the latter half of a UK tour. Tim Blake had left a month earlier and the band would never be the same again. Tim Blake went on to record three solo albums in the post-1976 era and was later in Hawkwind. Daevid Allen moved to Spain with Gilli Smyth but he too went on to record further albums beginning with Good Morning! with Spanish group Euterpe in 1976. The dominant forces in what remained of Gong were Steve Hillage and Pierre Moerlen, but the only vinyl output in this era seems to have been Hillage's solo album Fish Rising, which included a lot of band material, and an outtake Pentagramaspin, which got an airing on Virgin's 1975 double album sampler V, credited to Paragong. Hillage left Gong too at the end of 1975 to concentrate on a solo career. Still Gong soldiered on with a new line-up (G) recording Shamal, which was basically a jazz-rock album, released in February 1976. This was the final Gong release to fall within the time span of this book, but they carried on for a couple more years before evolving into Pierre Moerlin's Gong (Moerlin had been the band's dominant force since rejoining in 1976). There was an outfit gigging in 1988 as Daevid Allen and Gong, although Allen was initially the only former Gong member to figure in this acoustic outfit. By 1989 this had evolved into Gong Maison and included former Gong member Didier Malherbe. A self-titled album emerged on Demi Monde in 1990. Meanwhile Gilli Smyth had put together her own Mother Gong outfit. Daevid Allen also collaborated with Graham Clarke and Mark Robson as The Magick Brothers resulting in one CD, Live At The Witchwood 1991 in 1992 and earlier in the late seventies with the band Here And Now as Planet Gong. This aggregation produced one 1978 album (also available on CD) Live Floating Anarchy 1977. Then in 1979 he released About Time, an album credited to another of his outfit's New York Gong. Certainly it's hard to think of many bands whose history has been as confusing as Gong's! Aside from the band's studio output, collectors may be interested in the two Mantra releases in 1990. Both feature live material from the 'trilogy' era band; Live At Sheffield 1974, the stronger of the two, contains material previously on the Greasy Truckers album. Virgin's 1977 Live Etc also concentrated on their 'trilogy' era combining a mix of live material, BBC sessions and other bits and pieces most notably their ultra-rare 1970 French-only 45 Est-Que-Je-Suis. The Mystery and History of Planet Gong was a double album compilation of rarities, which came with a 20-page booklet. It includes Daevid Allen's 1964 Radio 3 spoken word performance of "Captain Shaw and Mr. Gilbert"; live, radio, and remixed versions of songs from the era when Kevin Ayers was their vocalist (from July 1971 - January 1972) and a French language version of Allen's 1977 45, Opium For The People.